At the time of his accident, Chris was working, taking classes at DeAnza College, and spending time off volunteering for a youth group and enjoying his favorite pastime, hiking. Following his 2012 swimming accident, he was diagnosed as a level C5-C6 quadriplegic, was hospitalized for four months, and was told he would never walk again. 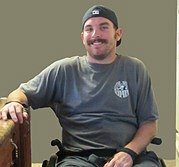 Through much determination, Chris has been able to regain upper body strength by attending a highly specialized rehabilitation program, but he needs to continue rehabilitation efforts in order to make further progress to return to his former life. Chris receives state benefits which cover most everyday living expenses, but has no coverage for his injury-related bills such as: home healthcare, rehab, doctor visits are very high and the specialized durable equipment that his physical therapists have recommended which will help Chris increase his strength and flexibility. To help offset such expenses, a fundraising campaign in Chrisâ€™s honor has been established with HelpHOPELive, a nonprofit organization that has been assisting the transplant community for more than 30 years. In 2000, they expanded their mission to include those who have sustained a catastrophic injury. All contributions are tax-deductible, are held by HelpHOPELive in the Southwest Spinal Cord Injury Fund, and are administered by HelpHOPELive for injury-related expenses only. If you would like to make a contribution please click the DONATE NOW button. Thank you for caring and for helping â€“ together we can all help make a difference in Chrisâ€™s life. It’s been 5 years since Chris’s accident and your donations today mean even more to help cover the cost of medical needs not covered by his benefits. He continues to work to maintain strength by playing wheelchair rugby twice a week. He’s grateful for the opportunity, but it’s a huge physical and mental effort to get to San Mateo from Oakland. In addition, his medical and rugby equipment repairs are not covered. Thank you for anything you can do to help Chris! Thanks to the support of friends and family this last year I was able to purchase a brand new wheelchair with the best support and comfort possible. This new chair and Wheels have made getting around town a lot more fun and not to mention making life a little easier. The last few years have been a time of rebuilding and learning how to become as independent as possible. The more independent I become, the more I come to depend on the equipment that keeps me going. As I’m sure you know this equipment is not cheap so your help is greatly appreciated. Over the next year tires and breaks will need to be replaced as well as a shower chair that is starting to break down. Thanks to this fund raising I will be able to replace the old shower chair and keep my wheels going strong. I have recently been invited to travel to Canada to learn from and train with a world class wheelchair rugby team. They will provide free housing, but I will have to pay for my airfare and food. This is my goal for 2016 and any help you can give will be greatly appreciated. I’m also hoping to be able to purchase new wheelchair wheels that are not covered by my insurance policy or state aid so that will be one of my priorities too. Physical therapy and exercise are extremely important to Chris’s overall health & mental well being. So 6 months after his accident he started working out with a wheelchair rugby team at the Riekes Center for Human Enhancement in Menlo Park. He was not allowed to actually play in games until 12 months from the date of his spinal cord injury, but he has passed that milestone and now plays with the Norcal Quakes. (View team picture in Chris’s photo album section on the right — click to view and click again to enlarge). Chris is the third player from the left. We think he looked like a mountain man with the beard, but now its long gone. 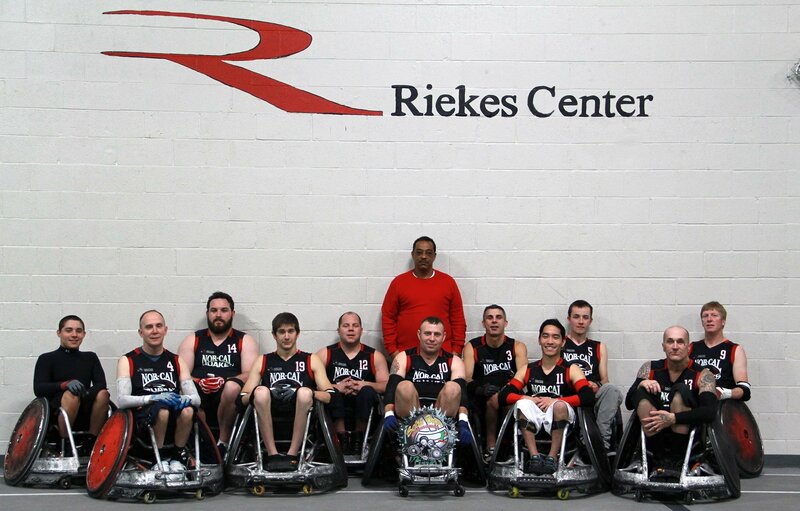 The Riekes Center partners with the local Veterans Association by donating rugby equipment and Chris has been able to borrow a rugby wheelchair for practice and games. Because use of this wheelchair is temporary, Chris needs to purchase his own wheelchair to continue playing for the long term. A quad rugby wheelchair costs $5,000 – $6,000, though, so any tax-deductible donation made to help reach this goal is very much appreciated! We're so proud of you, Chris, Keep up all your good efforts playing rugby and staying strong. God Bless! Hi Chris...Hope you are enjoying football today. Do you have a practice for wheelchair rugby on Tuesday?